When you deploy Microsoft SQL Server on AWS, you have many choices for how to optimize the performance, availability, reliability, and costs of your applications. Amazon offers multiple SQL Server versions, broad compute options, and numerous licensing options to optimize usage and reduce costs. You can choose the pay-as-you-go model and use the AWS license-included options, or you can choose to bring your own license (BYOL) on Amazon EC2. With SQL Server 2017 available on EC2 instances, you have great flexibility to deploy your SQL Server–based applications on either Microsoft Windows or Linux operating systems running on Amazon EC2. AWS today announced support for Microsoft SQL Server on Amazon Linux 2 and Ubuntu by offering license-included Amazon Machine Images (AMIs). With this release, you can launch your SQL Server 2017 on Amazon Linux 2 LTS Candidate and Ubuntu 16.04 (HVM) instances on demand using license-included AMIs directly from the EC2 console. The AMIs are available in all four editions—SQL Server Web Edition, SQL Server Express Edition, SQL Server Standard Edition, and SQL Server Enterprise Edition. This blog post discusses the differences in management between traditional Windows-based configurations and the new Linux SQL Server installations. The post also walks you through the steps to configure SQL Server running on a Linux AMI on Amazon EC2. This post assumes that you have configured a workstation in your VPC to connect to the SQL Server instance you install as part of this blog post. 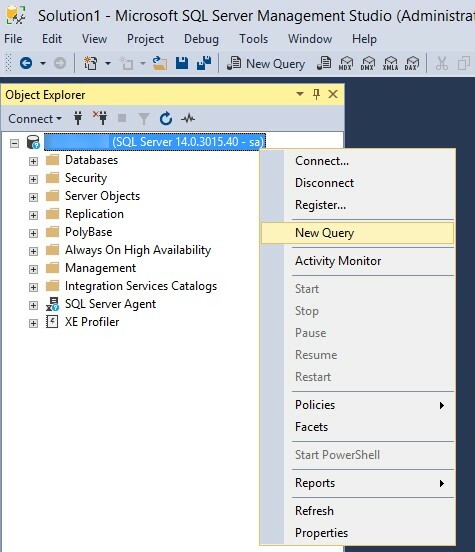 We recommend that you use SQL Server Management Studio (SSMS) from that workstation. You can download the SSMS bits from this site. Configuring SQL Server when it’s running on Linux is different from configuring SQL Server running on Windows. In the traditional Windows environment, you use the SQL Server Configuration Manager to manage changes to SQL Server services, TCP ports, startup parameters, or any other instance-level configuration items. For Linux-based SQL Server workloads, Microsoft has made a configuration script named mssql-conf available. The mssql-conf script is used to set parameters for things such as the default data and log file location, TCP ports, and so on. Let’s get started with the configuration steps. To view volumes and devices you’ve added to the Linux instance, run lsblk to see a list of all Amazon EBS volumes that you attached during launch. 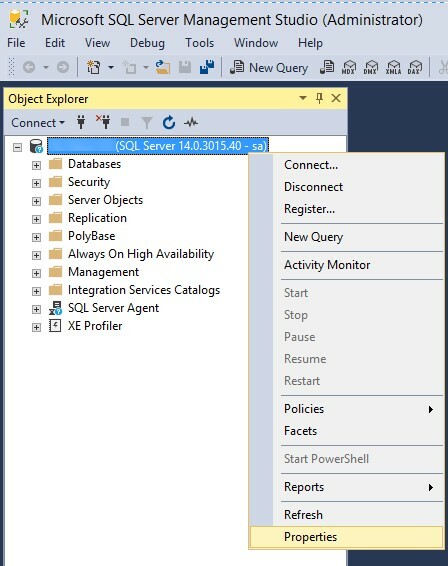 As a best practice, we recommend isolating data files from log files for the given SQL Server instance. Before you can change the default directory locations, you first create a target directory for new database data and log files. 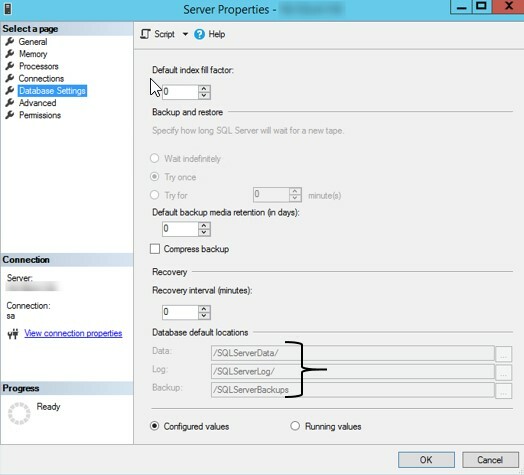 The following steps create a new directory named /SQLServerData. But before doing so, a file system needs to be formatted, a directory created, and that directory mounted to the device (volume). Now that we have these steps done, we can change the default data directory using the set command. The filelocation.defaultdatadir and filelocation.defaultlogdir settings change the location where the new database and log files are created. By default, this location is /var/opt/mssql/data. After you complete the preceding step, SQL Server needs to be restarted to apply the new settings. Before you do so, let’s also mount a different volume to a directory specifically for database log files. 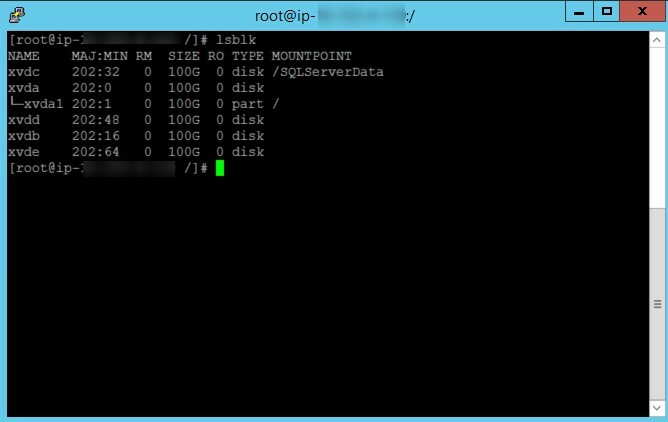 You can see from the screenshot preceding that /dev/xvdc has the /SQLServerData mount point. The steps include a similar mount point but for the default log directory. Now that the directory is created, mount the volume of your choice to the new directory. With the directory created and volume mounted, you should now have two locations. One directory is for the database data file, and the other is for the database log files. To list your block devices for viewing current mount points, run the lsblk command: You can see from the screenshot preceding that we have two specific mount points now, for database data and for log files. To change the default backup location, follow the same steps you performed for creating the file system. These are creating the directory, mounting the volume to the directory, changing ownership and group for the mount point, changing the default location, and restarting the mssql-server service. If setting the amount of memory that SQL Server can consume on the Linux instance is important to your application, you can do so by using the memory.memorylimitmb setting in the mssql-conf script. You can also enable and disable trace flags for the startup of the SQL Server service. We recommend that you set trace flag 1222, which is helpful for diagnosing deadlocks. 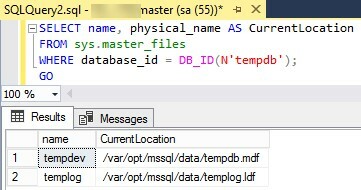 When a trace flag set using the preceding command, it is globally configured so that it is included every time the SQL Server service is restarted (startup parameter for mssql-server.service). Run the following command to query where your current TempDB data and log files reside: As you can see from the screenshot preceding, the TempDB data and log files reside within the same directory. 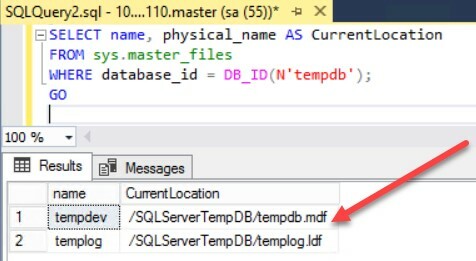 To confirm the modification, run the same query you ran in step 4.You can see from the screenshot following that we have now successfully moved the TempDB over to the /SQLServerTempDB directory mounted on /dev/xvdd. 10. To make sure that your mounts persist through a system reboot, add in an entry for the device to /etc/fstab file. You can run ‘df’ command to get a list of all mount point information in regards to their device names, space used, etc. You can use the system’s current device name (/dev/sda1, /dev/xvda1, etc.) in /etc/fstab, but we recommend using the device’s 128-bit universally unique identifier (UUID) instead. You are now ready to use SQL Server 2017 on the Linux AMI with best practices implemented for ease of administration. Bini Berhe is a solutions architect at Amazon Web Services.